From the Tucsons to the Rincons, the Santa Ritas to the Santa Catalinas, broadcast your details across the Old Pueblo with the desert splendor of the Tucson Flyer. 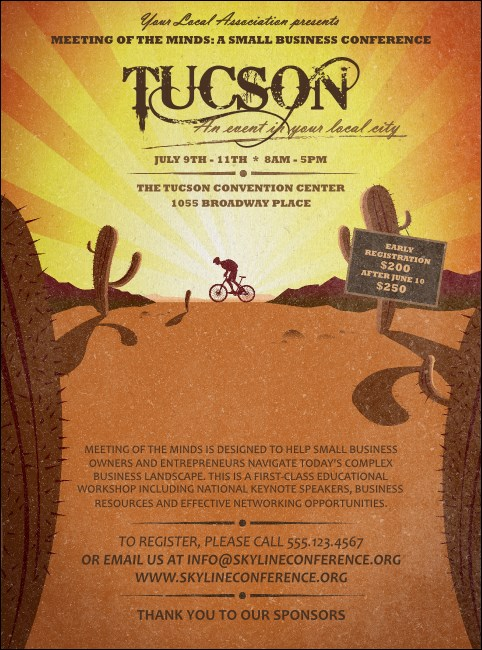 Embodying the spirit of the modern wild west, this Flyer depicts the stalwart cyclist crossing a rocky, saguaro strewn landscape as the morning sun lights the way. TicketPrinting.com wants to help you heat up your ticket sales.